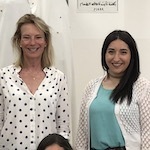 DSMT’s newest graduate is Rand, who gained her degree in Geography, History and Education in summer 2018 from Birzeit University. …”I am writing my fourth and final annual report. Let me talk about my senior year, it was the best year! I have done so many activities and left a finger print behind. First, I have finished my B.A. degree major geography minor history, also received my educational diploma for high school education. My final degree mark was 80.8, which is estimated very good. I know that I could have done higher marks but I trust that I have given my best effort, while participating in other activities. 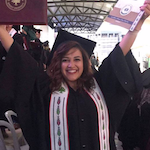 I have graduated with two degrees that I am proud of…….My graduation project was about “The economic and social changes in Al-Nuwaimeh” which a village located near Jericho in the west bank. My social group study was of three farmers, and the point that I was exploring was the causes of the loss of agricultural land and the social implications for these people. ……… For my social life I have made friends with lots of students, older and younger than me. The university had the perfect environment for this. In addition, I have been public relations officer in the geography club. ….We (the club) have done many activities such as trips, mass breakfast, free books, and preparing photo sessions for seniors. 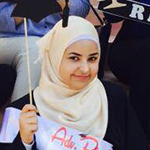 …..
Left: Haya at her graduation. Right: With her husband. Former DSMT school scholarship holder Haya was sponsored by a donor through DSMT when she was about to drop out of her first year for financial reasons. In summer 2017 she graduated in Audiology and Speech Therapy from Birzeit University. Well done Haya! We wish you every success for the future. 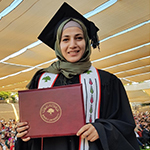 Aya graduated in Information Technology from Al Quds University in spring 2017. During her course she married and in 2016 gave birth to a daughter. After a semester off she returned to complete her degree course. Many congratulations to Aya on this successful outcome and for all her hard work and determination. Congratualtion too on the birth of her second daughter. In 2018 Aya met with DSMT visitors, other alumnae and students and has since set up a DTA-DSMT Facebook page to help keep girls in touch with each other. Congratulations to Rinad. Her range of study and exceptionally high grades throughout her course enabled her to graduate in three years instead of four! Rinad will take the exams for the Palestinian law licence in October 2018 and should obtain her licence to practice in spring 2019. She then plans to study for her Israeli licence, having successfully completed a course in Hebrew. 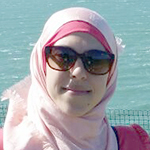 She is also studying for the second year of a Masters in Law at Birzeit University. 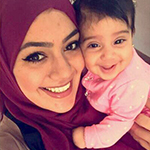 Hala graduated from Birzeit University in summer 2015 with a degree in English and Business. DSMT HE scholarships encourage girls to take a full part in university life including voluntary work and Hala certainly did this, developing her organisational skills and building up her CV. Despite high unemployment in the OPTs, after just a few weeks she secured a post in Jerusalem with international courier company Fedex where she has been promoted twice. Longer term she would like to study for a Masters, and gain work experience abroad to develop her career. She also acts as DSMT’s translator. The first DSMT award holder, Tamara Halasi, graduated in summer 2012 with a BSc in Materials Engineering at Al Quds University. Tamara’s participation in university life and her extensive volunteering led to her being selected in her final year to visit the UK with fellow students in 2011. In 2012 as a graduate she returned to London to take part in a five month volunteer project organised by Camden Abu Dis Friendship Association. 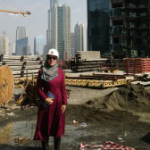 In 2013 she took up a post as an engineer with a multi-national company in UAE. After studying in the UK in 2015-16 Tamara is now back in Palestine and seeking a job, ideally in medical engineering. Click here to watch an interview with Hala and Tamara.